I love when my 8-5 job intersects with my Qute Hoots life! 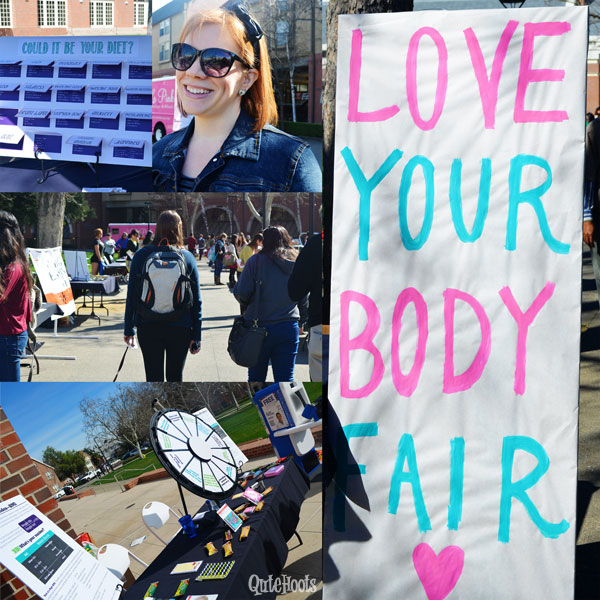 For the past few years at University of the Pacific, our department has organized and sponsored a “Love Your Body” Week. There are numerous events each day that promote healthy living and positive body image. We get the opportunity to impact our students in a thoughtful, positive, and healthy way. This week has changed the way I interact with my own body, and brings me fulfillment in my job. Our theme was “Love Your Body, Love Your Mind, Love Each Other”- something I think we can all work on! This display was located in the University Center in a high traffic area. Each wall is 7’x8′ and is made of Velcro. 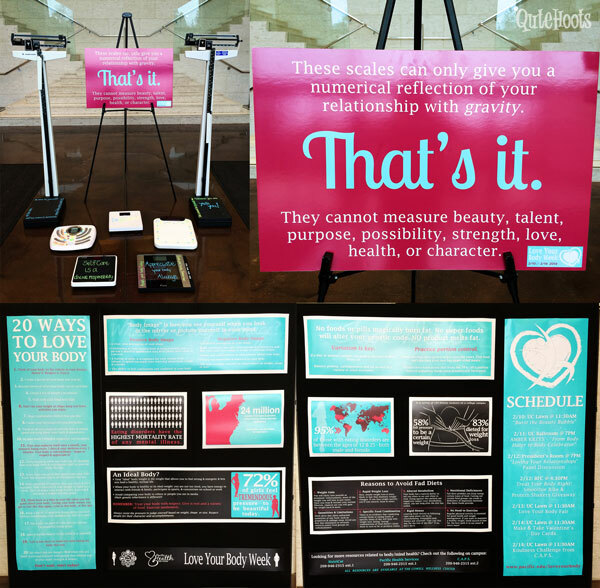 One of our students, Lauren, created all of the posters with information about ways to love yourself, fad diets, and eating disorder statistics. We purchased scales from various thrift stores as an art installation to get people to stop and think about ending the vicious cycle of basing self worth on the number on the scale. 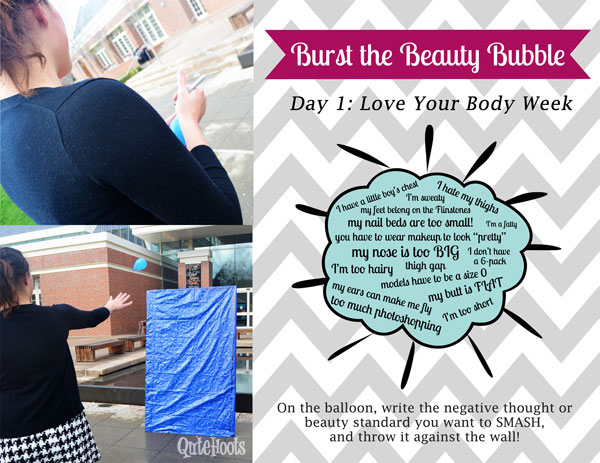 We asked students to write something negative that they think about their body on a water balloon and smash it against a wall. It was so much fun and honestly so cathartic! To make this event work, I covered a plywood stand with a tack-covered tarp to ensure the balloons popped. Amber was a great addition to our week. The students loved her talk about her journey to accepting and loving her body. 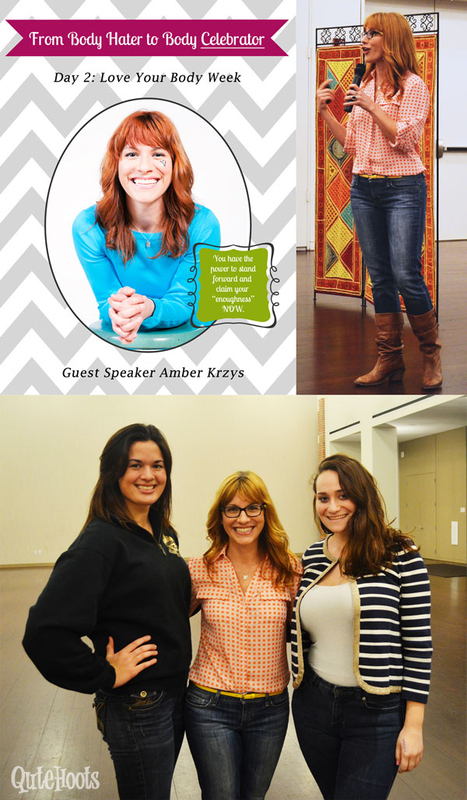 To hear her speak, check out her TEDx talk and her adorable website. These ladies are two of my students, Madelyn and Danica! Without them, Love Your Body Week would not be such a success. Our department owns a smoothie bike! It combines fitness with healthy eating, which is a win-win. Our campus dietitian, Alex Caspero (of Delicious Knowledge), demonstrated a mean green smoothie of spinach, almond milk, bananas, and frozen berries. 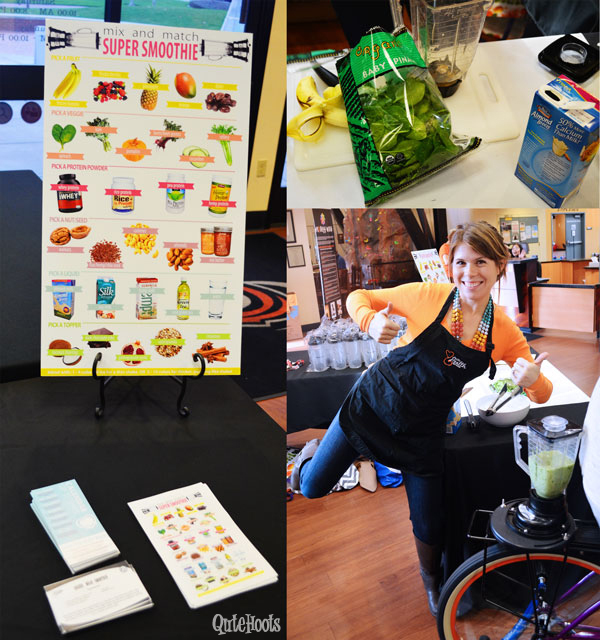 Our recreation department hosted the event and gave away awesome smoothie shakers to the first 100 participants. The fair is by far our most difficult event to manage, but has the best attendance and reactions from students! We invite dozens of vendors from on and off campus to offer free manicures, make-up demonstrations, massages, blood pressure and BMI checks, and a host of other fun and healthy things to see depending on where a student is in their journey to love their body. This is the day I get well over 10,000 steps on my pedometer! The tables I set up for my department featured a spinning wheel, blood pressure/BMI kiosk, fun prizes, and an interactive “Could it be your diet” symptom board. This was BY FAR my favorite event of the week! We know by Friday (especially before a 3-day weekend) the attendance levels at just about any event will not be super high so we try to end the week with something really low-key. Since this year our final day was on Valentine’s Day, I thought making cards would be perfect. In the weeks leading up to the event, I had my students stamping, punching, and cutting out lots of fun items so it would be a no-brainer to create a card. All the students had to do was pick out a few embellishments and glue them on how they wanted. Love Your Body Week slows me down and reminds be to stop being so hard on myself. It refocuses my energy to think positively, keep fueling my body with delicious and nutritious foods, exercise and be active on a day-to-day basis. Follow our board on Pinterest with inspirational messages and tips to love YOUR body!